Description: Firstborns rule society. Secondborns are the property of the government. Thirdborns are not tolerated. Long live the Fates Republic. It’s no secret that Amy Bartol is one of my favorite sci-fi authors. She has these crazy well thought out and imaginative stories that I just crave. Like on a molecular level. Crave sci-fi? I pick up Bartol’s books. Want to read something with great writing? Pick up a Bartol book. Want smoldering romance with high stakes action? Reach for my Bartol books. Yup, it’s that good. 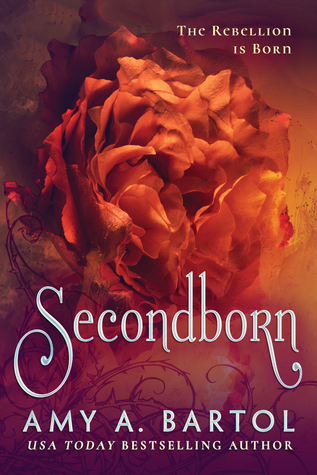 When i was able to pre-purchase Secondborn through Kindle First to Read I screamed. And then promptly devoured the book. And then hated myself because it was two months before publication and the next book was going to be months and months away. I have zero chill. Basically Bartol took all the parts I craved and loved from her Kricket series and went all out in the sci-fi world with her new series. This is the first of three books and I’m honestly torn between telling you to buy it and read it now or wait for the last book to come out so you can binge. Why not both? Roselle St. Sismode is the perfect main character. She’s equal parts fierce, calculating, naive and damaged. On one hand you have this perfectly trained killer since she could walk and on the other you have someone who is naive in the outside world and how corrupt the government and society is around her. Secondborn’s are essentially used as backups in case the Firstborn died. Other than that they are the property of the government and used as soldiers, servants, etc. Basically anything the Firstborn’s refuse to do they have a Secondborn to do it. There are many injustices in this system and anyone who is Thirdborn, or pretty much any child after the second is killed on spot. Obviously this causes a lot of issues and conflict within the society and there is a ton of action and civil unrest because of it. Overall this story is fast paced, the world building is amazing and the characters range from hilarious to swoon worthy to instant rage. There is something for everyone in this new series and I highly, highly recommend it. Would I buy this book? Already did and would be willing to do it again! Would I recommend it? YES!!!! Would I re-read it? Yes! I’ve read this twice already.